The famous red and white striped cliffs at Hunstanton are an eye-catching attraction. The stripes are caused by layers of different coloured rock. 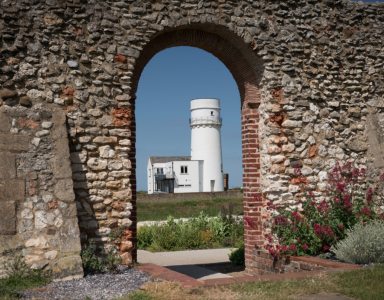 During a visit to the cliffs you can have fun discovering the history and nature of the area by looking for fossils, hunting for creatures in the rock pools or taking a stroll to view the old buildings perched on the cliff top. 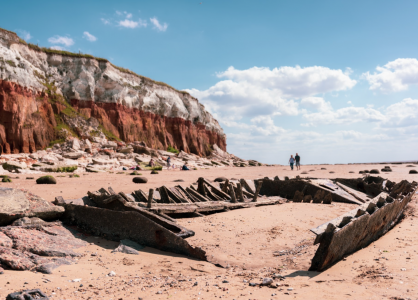 The seaside town of Hunstanton began as a purposely-built resort in 1846 and retains its Victorian charm and character to this day, remaining a popular holiday destination for visitors of all ages. From buzzing family activities such as Crazy Golf, Pitch-and-Putt, and the Oasis Leisure Centre to the tranquil Esplanade Gardens there is something for everyone. The town’s array of gardens are especially delightful during the Spring and summer months, and you can follow a self-guided Horticultural Trail to make sure you experience them all. 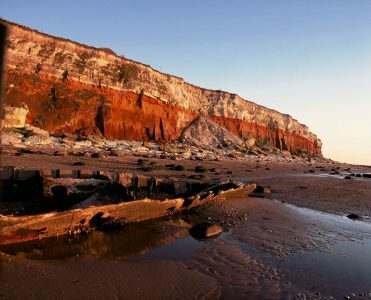 Hunstanton’s excellent beach offers ideal conditions for playing on the sand, exploring rock pools, and enjoying the sea.